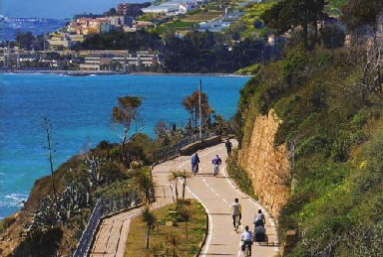 Liguria has a brand new cycling/pedestrian pathway that hugs the coastline and provides level, bump-free pedaling. Come experience the beauty of the Italian Riviera by bicycle. Cascading flowers cover old rock walls, palms sway in the cool ocean breeze that carry the citrus scent of lemon trees, and sandy beaches edge the wide expanse of the ocean. Vineyards and olive groves creep up the terraced hillsides, nourished by the warmth of sole. Sun-washed and sophisticated, the Riviera is picture-perfect. Stretching for 74 km altogether, the Cycling Riviera pathway runs from Tuscany to the south of France. The eco-friendly cycling path is smooth and wide, with plenty of room for every speed of bicyclist. 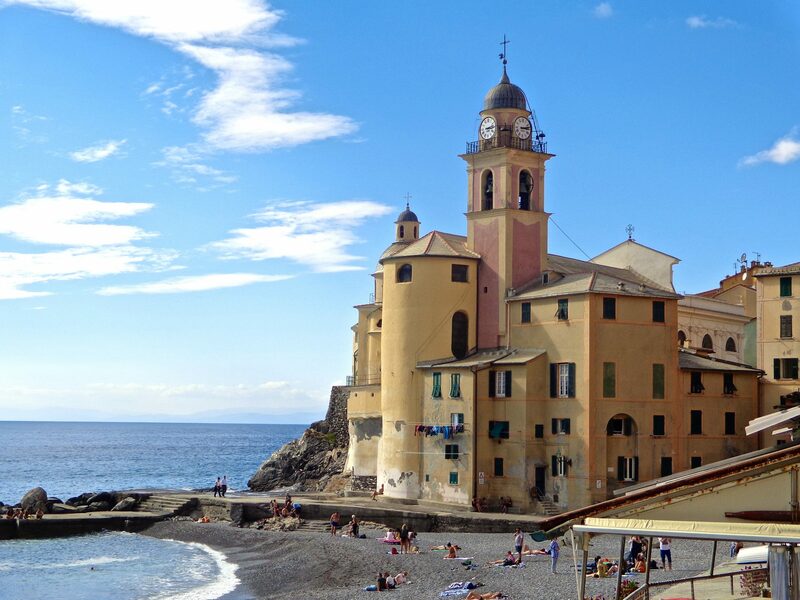 The first 24km stretch, from Ospedaletti via San Remo (think Casino) to San Lorenzo al Mare, follows an old railway line, winding though eight historic fishing villages. However, several options for shorter bicycling routes are given in the link at the bottom of this article. Some of the pathway goes through a tunnel that is well-lit and roomy. “This is the first time in Italy we are replacing an old railroad with a cycle/pedestrian path that will create a protected natural environment, car free, and tourist friendly,” said Tullio Russo, a member of the private partnership that developed the project. The path provides access to pristine beaches and an ecological coastal sea park that protects a whale sanctuary. For those who want to ride further, the path becomes a gateway to the Milano-San Remo route. Mountain bikers can explore the nearby Maritime Alps. Liguria is actually separated into two “Rivieras.” To the west is the Riviera di Ponente, which hosts resort towns like San Remo. The Riviera di Levante to the east, with classy Portofino and the dramatic Cinque Terre, is preferred by many writers and artists. Genoa, the Ligurian capital, separates the two of them. During the 19th century, the Riviera was famous with European expats who outnumbered the locals. Wealthy aristocrats were attracted to the very temperate climate, amusing themselves with lavish botanical gardens. They gambled in the casino’s of San Remo, and dined in several fine art-nouveau villas. 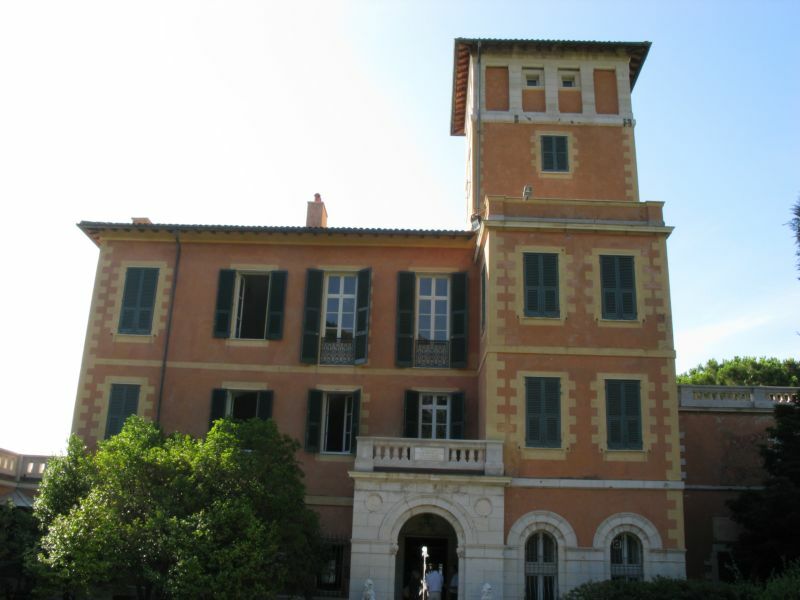 The Villa Hanbury, also associated with Villa della Pergola, was popular with Queen Victoria and later Winston Churchill as a holiday stay. The last years of Alfred Nobel were spent here. Worthy of a peek, the villa is located in Alassio, just 20 km from San Remo and not far from the cycling path. Of particular delight are the unique local wines and foods of Liguria. Stop along the way for a taste of the famous Taggiasche Olives, the unusual Albenga purple asparagus, or the Ligurian red prawns. The basil Pesto sauce is the culinary masterpiece of Liguria. Being on a bicycle makes so many things possible, providing the flexibility to explore as parts of the pathway wind through villages. So much to see and do on bicycle, and so little time. Choose your itinerary and proceed with reckless abandon. A great memory is in the making. I am coming to Liguria in late May 2016 and hope to do some pedalling. There is a chance I will be on a new Pinarello. Alternatively, I will bring shoes and pedals from rural Australia and try and hire a bike! Looks wonderful!! You will undoubtedly have a wonderful time! It is such a great area to explore on bicycle. Not to mention gorgeous! Thanks for stopping by and have a wonderful time in May. I reckon it will be great. We are doing the Dolomites, Piedmont and finally Liguria! The Stelvio Pass is my great challenge, but something I have long set my heart on climbing. Much to look forward to! A useful and interesting post – the Liguria cycling post is something new to me.I enjoy the picture tapestry effect of all your blogs and particularly the background content/info of the Villa D ‘Este ,Como and Caravaggio postings .Is the Columbus house as much a ” genuine fake” as the Juliet house in Verona? You might enjoy reading the short essay on Orvieto Duomo ” Last Judgement”(better than Michelangelo)by Zbigniew Herbert,it is in his little collection of pieces entitled Barbarians in th e Garden.keep up the lovely blog ! Thank you so much for your compliments and great ideas. From what I understand, Columbus house is genuine, however there is not much left of it. It is mainly the facade, or front part of the house. Tall and narrow. I will check out the essay on the Orvieto Duomo. What a beautiful church. Thank you again, I love the interaction!